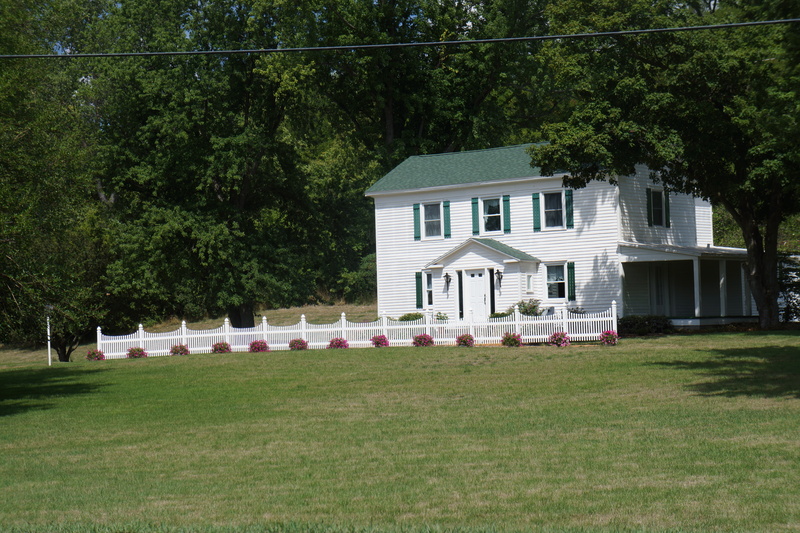 Mile 19: For 4 miles today I biked on Stateline Road which separates Indiana and Ohio (photo). As you may remember, I noted hundreds of windmills in Illinois. 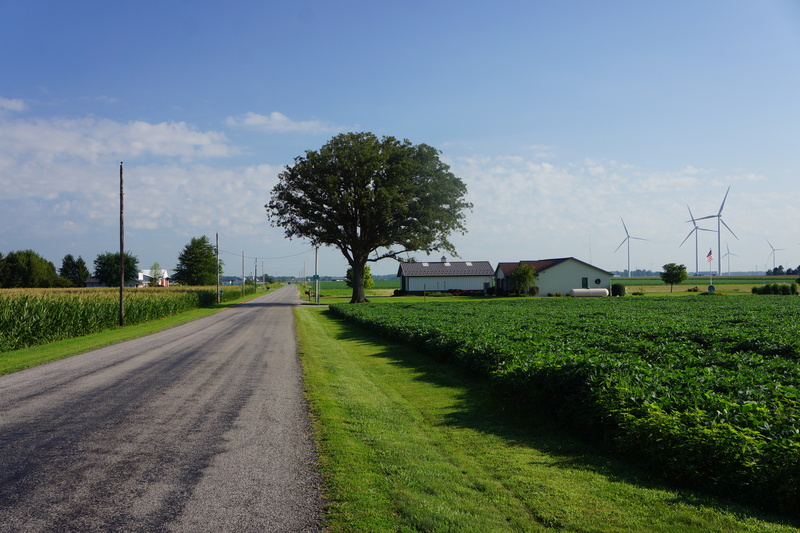 Interestingly, I didn’t see any windmills during my travels across Indiana (ending with the scene on the left side of the road above), but as you can see above on the right side of the road, windmills were erected over many square miles in Ohio at the Indiana state line. I wonder why? While the scenery in Indiana as I left the state this morning was similar to what I have seen over the last week, the scenery in Ohio changed quickly when I entered the state, not for the better. Population density was much greater than Indiana and Illinois based upon numerous and unattractive homes I biked past. I found little interesting enough to photograph during my first 40 miles in Ohio. The scenery did seem to become more attractive as I paralleled the Maumee River past Defiance, OH. I can say that the roads in Ohio were great. The excitement today was a incident that I would describe as the closest near miss bike accident I have ever experienced. As I was biking into Defiance, OH, a woman in an SUV traveling in the same lane and direction as I was (no other traffic), turned right, at a green light directly in front me. I don’t know if she didn’t see me, thought I was turning right, or thought she was farther ahead of me. Regardless, I had to slam on both brakes (I was traveling about 15 mph) and began to slide left and right as I fought to keep the bike upright. I started to fall to my left side, but was saved from falling by hitting my shoulder against the rear of her SUV. By that time I had been able to get my shoes unhooked from the pedals and kept myself upright. She kept going (I suspect hearing my commentary as she drove away). Fortunately, no damage to me, and more importantly, to my bike – only a temporary rise in my blood pressure and heart rate. I was so upset I forgot to stop at the Dairy Queen in Defiance as I had planned. I’ll have to have a double desert at dinner tonight. P.S. Talking about desert, since the tour started I have lost 2″ in waist size (and probably 10 lbs) and need to buy some new pants and belts at LLBean in Freeport, ME. 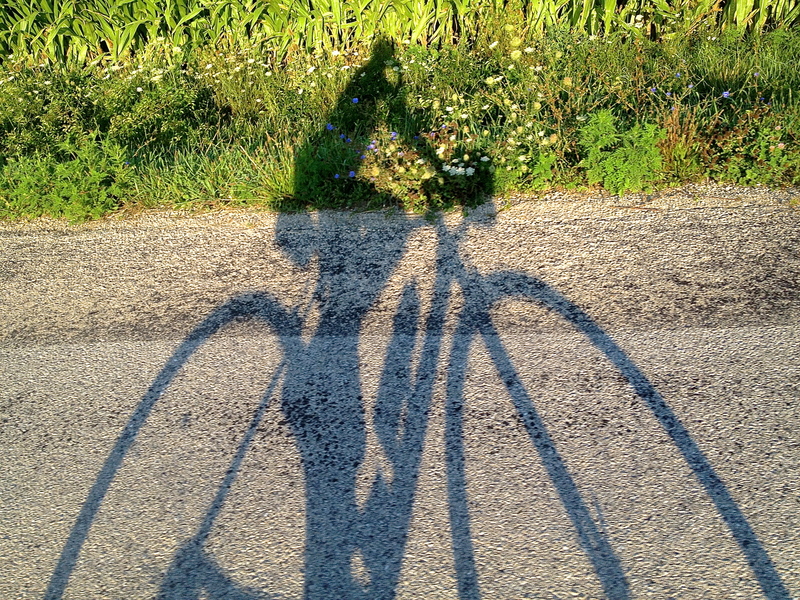 Mile 11: As I was biking at 7:30 am, I took this photo of myself with my iPhone. 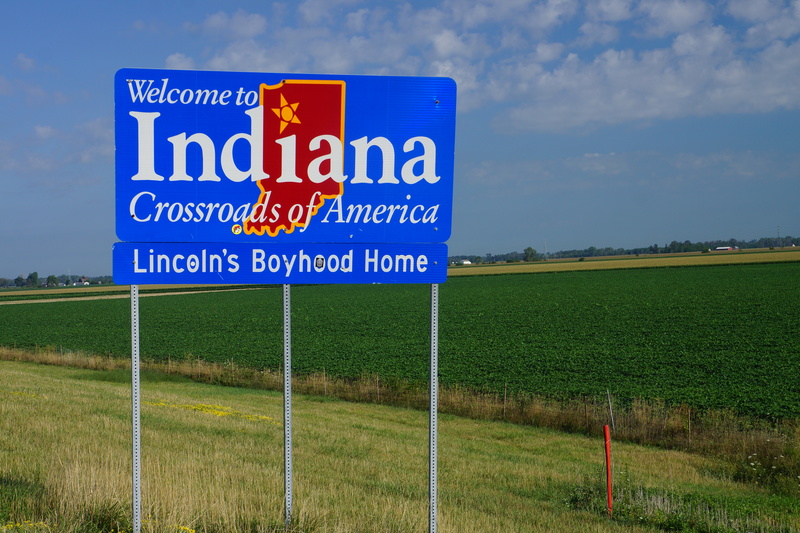 Mile 18: Since I didn’t get a photo of the welcome to Indiana sign when I arrived, I decided to get it as I left. 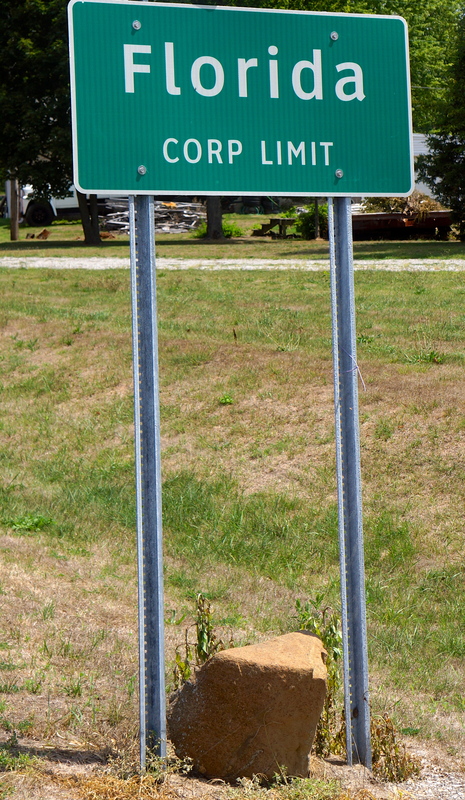 This sign was on Highway 30 near Monroeville, IN. 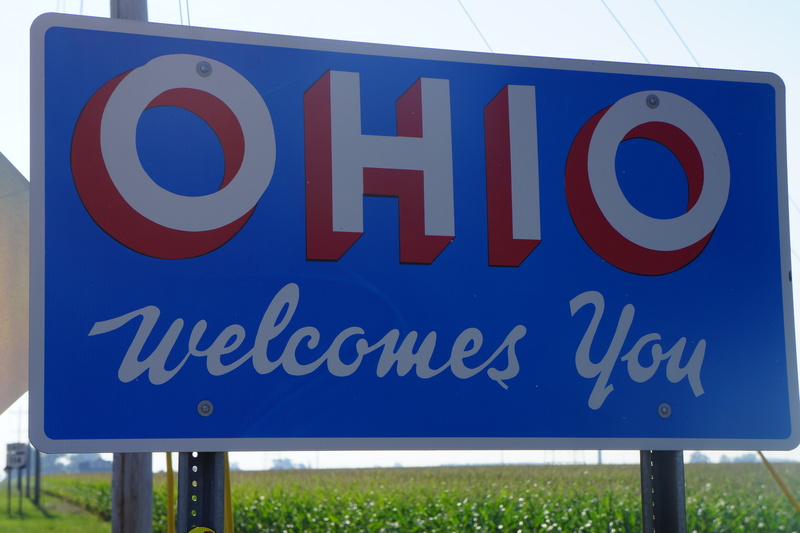 Mile 18: Welcome to Ohio. 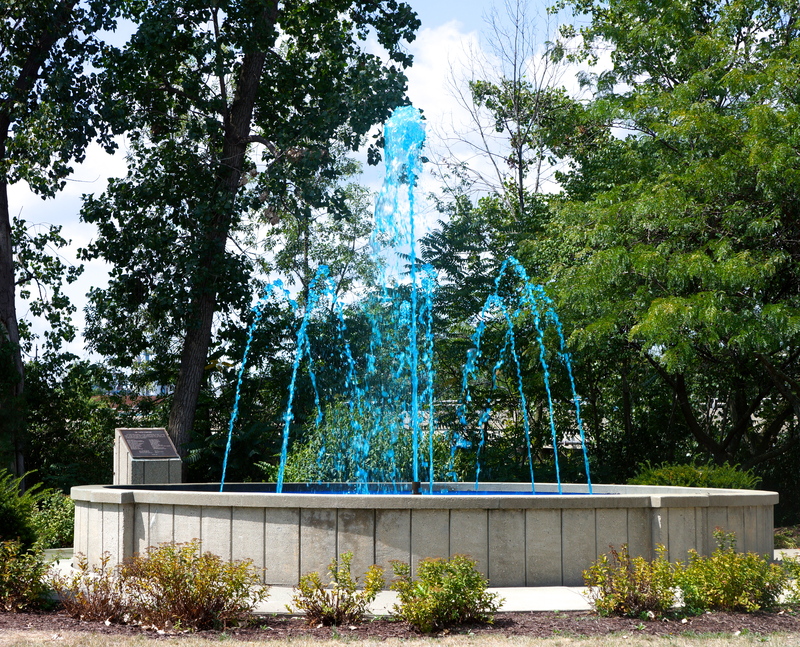 Mile 55: I did not Photoshop this fountain on River Drive (Maumee River) in Defiance, OH. The blue water is what was flowing. Mile 62: A stately home on River Drive near Defiance, OH. Mile 65: Little did I know that Florida was in Ohio. Whew! Quick thinking saved the day! You are to be congratulated and applauded. “most importantly” the bike wasn’t hurt? Hmm…I beg to differ. Glad you were not hurt by that stupid driver Steve. Steve, We continue to really enjoy the blog and the pictures. Really glad that you were not hurt in the near crash. Be careful out there. We’ll keep reading your blog and look forward to getting together with you when you get back home! Thanks Michael. Maybe I’ll join the spinning group to keep in shape when I return. Give my best to Teddi.